Wijilan, a street that has been known for its local delicacy, now has another treasure to be proud of. An area renowned for its gudeg (a local delicacy made from unripe jack fruit stewed with palm sugar and coconut milk) has now evolved into a home for Indonesia’s future beat makers and rappers. Started as a community for hip hop enthusiasts, Hellhouse has been in the country’s music scene since 2007. The collective, which has also founded their own indie record label, has shown their dedication to music and the community through collaborations and regular events. Other than being known for producing several albums/singles of many great Indonesian rappers such as D.P.M.B, Mario Zwinkle and Boyz Got No Brain, last year, the group dived into the online publication world by releasing an e-magazine called Hellmagz. Last year also marked the release of a documentary, titled It’s Wijilan. 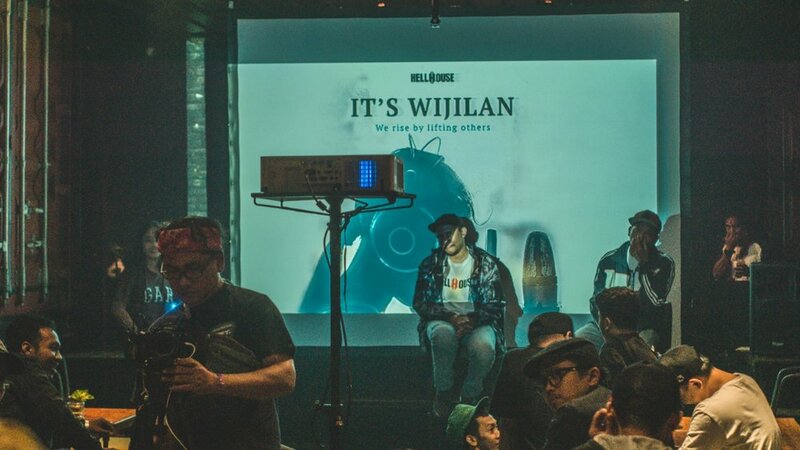 The film documents what happened during an event of the same name, which was launched by Hellhouse as part of the Kids on the Beats workshop’s activation. The event served as a platform for the children participating in the workshop to perform and show what they had learned. It was supposed to be a multiple-day-event that would close out the whole street, with its big stage and complicated sound systems. Unfortunately, after the first day, the organizer received negative responds from some concerned citizens and local authorities, who found the collective’s name offensive, believing that “Hellhouse” was inappropriate because it had the word “Hell” in it. One of Hellhouse’s founders, Alexander Sinaga, commented on the controversy, saying, “A few days after the meeting [with the local police], a German friend told me that ‘Hell’ in German means ‘bright,’” he laughed, lamenting the fact that he didn’t have the chance to tell the the authorities about it. Hellhouse was forced to scrape off any attributes that contained their name on every store and homebase around the Wijilan area. Globetrotter chatted with Alexander to discover more about the collective and their vision for community growth. Globetrotter Lab : Can you give us a brief explanation about the “Hellhouse” collective and It’s Wijilan? Alexander Sinaga: Hellhouse is a Yogyakarta-based hip-hop collective that was founded in 2007. We have a variety of activities involving various creative individuals who represent the spirit of regeneration through our regular activations/events. For the past few years, we have also evolved into an indie record label. We have released a couple of singles, music videos, albums and also movie soundtracks for some Indonesian movies. It’s Wijilan is a documentary about our dedication to Wijilan, a small kampong inside the Kraton (royal palace) area in Yogyakarta. A place where we live and blend in with the local community, where Hellhouse’s shop has been located for years. All of us have always had the desire to contribute to the communities around Hellhouse, be it internally or externally. We realized that a real contribution could only be done by sharing our knowledge, collaborating and creating through a music event and workshop for children at an event we called It’s Wijilan. Globetrotter Lab: When did you guys have the idea to make this movement/project? Alexander Sinaga: In Hellhouse, we have our own yearly meeting to discuss about our upcoming events. Coincidentally, the theme that we agreed on at that time was all about giving back, so we came up with an idea to do a hip-hop event that would involve our community. We offered workshop sessions on how to create lyrics, play musical instruments and record a song. Globetrotter Lab: Are there any special methods you used to teach the children? Alexander Sinaga: No special method, we just tried our best to be close to the children naturally. It was all about having fun, everything that the children made purely came from their creations. Globetrotter Lab: What is Hellhouse’s motivation in constantly contributing to the community? Alexander Sinaga: We are aware of the social and economic functions of a community. These social functions don’t only exist merely in the form of a “Vision and Mission” statement that will only affect one particular community. The way we do it is by engaging in CSR activities in communities. Globetrotter Lab:: Any hopes or messages to those who have watched the documentary? Alexander Sinaga: Start getting yourself involved in spreading a positive energy and, with a healthy mindset, supporting community regeneration through your own talents and potential. Globetrotter Lab: What’s next from the Kids in the Beats? Alexander Sinaga: Could be a new single, music video? Or even a full album? We’ll see [laughs]. Follow Hellhouse on Instagram and Facebook.